Transcription is a popular way to earn a living from home. In fact, it was the very first work from home job I landed! Granted, I didn’t set out to become a paid typist. But it was still a welcome way to earn a living from the comfort of home. You see, after years of working in a cubicle, I finally quit the corporate world to pursue freelance writing. As it turns out, becoming a highly paid freelance writer takes time. So, while I built up my writing biz and portfolio, I needed money coming in to pay the bills. A girl’s gotta eat, right? What I loved about working as a transcriptionist was the flexibility it afforded me. As a new mom who was also side hustling like crazy to build a writing career, transcription allowed me to work when and where I could. And while I don’t currently type for a living anymore, it’s definitely a career path I recommend for anyone looking for a high-paying way to work from home. As a bonus, you can specialize in a specific type of transcription based on your interests. A great option for anyone looking to work from home in healthcare is medical transcription. And you can launch this lucrative career in under a year. The world of medical transcription has evolved a lot in recent years thanks to technology. Today, many doctors and hospitals use speech-to-text software, which automatically turns recorded dictation into text. However, software isn’t perfect. And that’s why medical transcriptionists are needed to both transcribe dictation AND edit speech-to-text files. The reports you type out eventually become a part of a patient’s medical records. Review and correct reports that were created by speech recognition software. Being able to both transcribe dictation and edit software-generated text is key to succeeding as a medical transcriptionist today. What’s The Difference Between Medical Transcription And General Transcription? A general transcriptionist often handles a lot of different files. Some common types of audio a general typist may transcribe include lectures, focus groups, and business meetings. Often, you do not need any formal training to become a general transcriptionist. In fact, there are a number of companies that hire general transcriptionists — no experience necessary. Medical transcriptionists focus specifically on the medical field. Typically, this means transcribing doctor’s dictation (the audio doctors record after meeting a patient). To be successful, you’ll need a good understanding of anatomy and medical terminology. That’s why it’s important to have medical transcription training. This gives you a solid foundation of medical vocabulary, terminiology, and a general understanding of the human body — all subject matter that you will encounter while transcribing doctor dictation! According to the Bureau of Labor Statistics, the average medical typist earns roughly $30,000 each year. Keep in mind, transcriptionists are often paid based on production. That is, the more you work, the more you earn. For example, medical transcriptionists might earn $0.05 for every word typed, regardless of how long it takes you to type it. So, let’s say you receive a doctor’s dictation that is an hour long. It takes you 4 hours total time to completely transcribe and edit your transcript. The final result is a 3,000 word report. As you become more familiar with a doctor, particular industry, and transcription in general, your speed will increase which will ultimately increase your income potential! Back in the day, you needed a special machine to play teeny tiny cassettes in order to work from home as a transcriptionist. Today, the majority of all medical transcription work is done online with software. The software you’ll need depends on the medical field you work in, the doctor(s) you transcribe for, and their preferred format. Do I Really Need Training To Become A Medical Transcriptionist? To even be considered an entry-level candidate, you will need some type of training or certification under your belt. Without it, you’ll find it next to impossible to find work. The good news is, you can train online to become a medical transcriptionist and editor (and be ready for your new career in under a year). Career Step is an online school that provides career-focused education. It’s a great option for busy parents, caretakers, or those working a full-time job since you can work at your own pace and finish school on your timeline. With their Medical Transcription Editor program, you learn the skills needed to be a competitive entry-level candidate in the growing healthcare industry. Plus, you’ll be equipped with the knowledge needed to both transcribe audio and edit transcripts after completing one short course. The course was developed by experienced medical transcriptionists to specifically prepare students for today’s technology-driven approach to medical transcription. Because doctors and hospitals may sometimes use speech-recognition software as well as traditional dictation methods, the Career Step Medical Transcription Editor course prepares you for both transcribing and editing transcripts. Upon completing the course, graduates are prepared to enter the workforce as either a medical transcriptionist, editor, or both! Why Should I Choose Training With Career Step? For starters, Career Step is well known in the medical transcription and editing community as providing quality education and training for more than 20 years. Employers even seek out Career Step graduates to fill open medical transcription positions! In fact, 92% of Medical Transcription Editor Career Step students find employment after graduation. All of this (and so much more) is offered to students at one low tuition price. There’s even tuition assistance available for those who qualify. 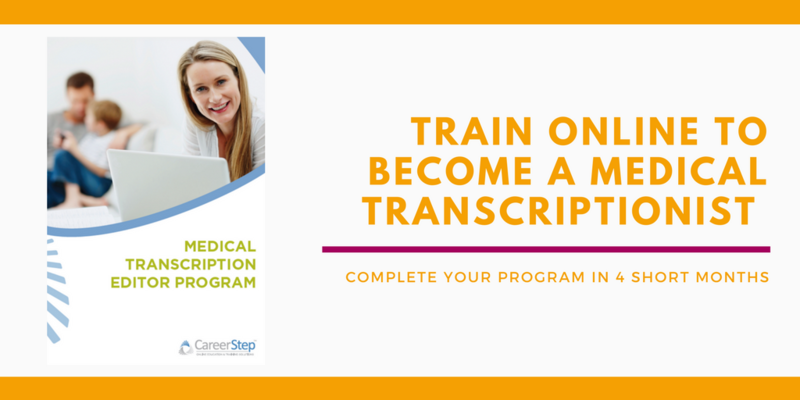 Head on over to Career Step today to learn more about how you can train online for a rewarding career in medical transcription. It’s a BIG decision on whether or not to go back to school to learn a work-from-home skill. I get it. That’s why I recommend you do tons of research ahead of time. Before you jump all in, check out this video to see if working from home as a medical transcriptionist is right for you. P.S. This post contains affiliate links for Career Step. When you enroll in a Career Step program, I receive a small commission. Don’t worry, it doesn’t cost you anything extra. Learn more about my use of affiliate links by checking out my disclosure statement. I’m having a hard time right now, I’m feeling that college is the only way to be successful and get a good paying job. Im having a hard time with college, so I’ve been reading through the site and it seems that there are many careers that I could do without a degree. I can’t imagine going back to college for more years to make money at entry level. I just can’t do that. I don’t expect fast results, but I would rather learn what I need to know from these courses online than go to college. Anyway my point is, is it really possible to make a career online from these courses? I’m excited to do so, but I don’t want to get my hopes up and end up at square one. Let me know your thoughts, thank you. Absolutely you can get a new career with these online courses. I highly recommend them because they are an affordable way to kick-off a cubicle-free career without having to invest a lot of time, energy, effort or money. 1. I want to be able to develop many online skills. From blogging, writing, proofreading, coding, freelance, etc. What do you think would be the quickest to learn, and to be able to make some decent money from? I’m looking for something to hold me down as soon as possible while I work on those other skills. 2. Is it still possible to make a living with the websites you posted from “piecing together a living online”? I’m looking to get some more income coming in that’s flexible for me that can pay the bills. 3. I actually tried fancy hands and most of what they ask to do, I have no idea how to do it, like scheduling something, or using excel, they don’t train you, so I’m kind of lost. 4. I’m also lost on some of the other sites on how to make a decent income, I have many websites saying that I’ll only make .5 a task or something (clickworker) or $250 a month from rev. Am I doing something wrong ? These seem like very low payouts that make it hard to live. I would appreciate if you can help me out to become a medical transcriptionist online. Am already a retired nurse and wanted to pursue this career to be productive even at this time. However I do not have any idea how to go about it. I was just trying to think of a job for a family member who Just moved back home from Florida and thought of a medical transcriber as I have 2 friends who have done this from home home for some years and absolutely can’t imagine doing anything else. For any young person , or retired, willing to learn the task , I just don’t know how you will find anything with more flexibility. But remember, you must be willing to stick to the task. So true — you’ve got to be willing to stick with it. I’ve known a handful of medical transcriptionists too over the years. They all have grown to successful typists, but it took some time. 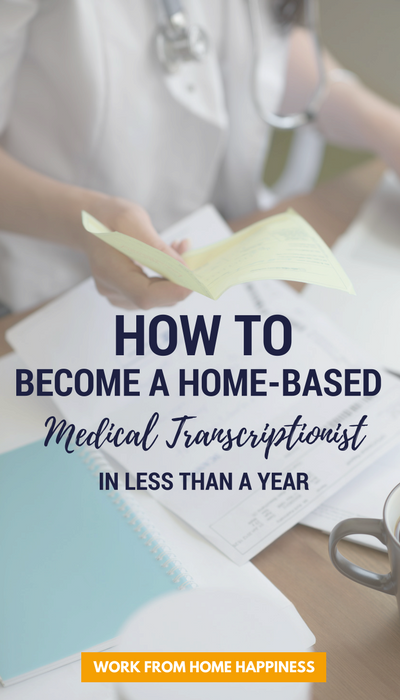 It does take a little effort and tenacity, but medical transcription is a great and flexible way to earn a living from home. Good morning Ashlee I just read about the online course for Medical Transcription and Editing. Here’s a little about myself. I just recent graduated from college with an Associate degree in EHR and working on my certification now. But, not able to get work where I live. So, I have been looking into this for months now but I didn’t want to spend a lot of time in school again. I am a retired nurse. I worked for 43 years. My A&P is a bit rusty. My typing skills are slow at best. I am finding it impossible to live on pensions. I would like to learn more about this type of work. I think I would be good at it. Please tell me more. If I understand correctly, you can pass the course at you own speed; i.e. less than a year. That’s exactly right — at CareerStep the course is self-paced. Many students finish it within a year. However, you can take longer than that, if necessary. Good luck!